More a shopping mall than an app, Microsoft designed the Video app on your Windows 8 tablet to pull you into its two storefronts: The Movies Store entices you buy or rent movies, and the Television Store sets the hook for TV shows. To make sure your wallet’s available, you can only use the Video app when logged in with a Microsoft account. From the Start screen, tap the Videos tile. The Video app appears. The app immediately confuses things by changing its name to Xbox Videos. That’s because the Video app lets you play videos to your Xbox game console, if you have one, so you can watch your movies on the big screen. Browse to the type of video you want to watch. My Videos: Scroll to the hidden area beyond the screen’s left edge to see videos living in your tablet’s Videos library. Spotlight: Time-dated offers often appear here, letting you buy movies before they’re released to DVD, for example. Movies Store: Tap any tile to browse trailers, buy, or rent movies. Tap a video’s tile to see more about it. A window appears, with buttons that let you buy the video, see more about it, watch its trailer or, in the case of TV shows, buy a season package or individual episodes. 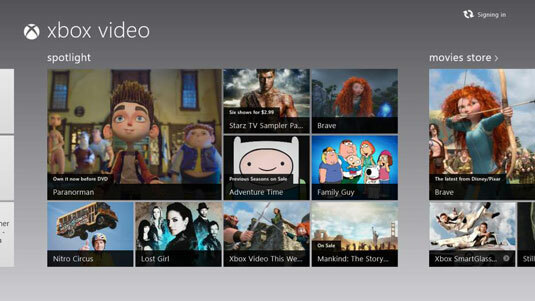 Tap a movie or TV show tile from the storefronts to rent, buy, or download the video to your My Videos section. The app charges the credit card associated with your Microsoft account, or prompts you to set one up. Tap any video in your My Videos section to begin watching. Swipe up from the screen’s bottom to expose buttons for pausing, playing, and skipping forward/backward. The Play To button lets you play the video through your Xbox 360 game console, if you have one. View free things at first to familiarize yourself with the process. Look for free TV pilots, movie trailers, or “behind the scenes” promo videos. Rental items and some specials are time-dated, meaning they’ll disappear from your Videos library after a certain date. Before traveling, look for items with a Download option. After these items are downloaded, they can be viewed when you’re out of range of a Wi-Fi connection. Before buying anything, you must type in your Microsoft account password, a safeguard against accidentally brushing against a Buy button. Don’t think you’re restricted to your tablet’s Video app for movies. Netflix has its own app, letting you watch streaming movies. Amazon’s videos are available too, if not in app form, then through your web browser.